I’m a sucker for a spicy peanut soy sauce combination like you find in pad thai or kung pao. There’s just something about it that I can’t resist. I even whip up hamburgers every now and then with peanut butter and sriracha sauce. Most times though when you play with Asian cuisine, it’s loaded with fat from sesame oils and the peanut butter. Especially if you’re eating it in a restaurant. I wanted to see if I could come up with a version that didn’t completely blow the calorie budget for the day but still had great flavor and was easy to prepare. I already had grilled chicken breasts in the fridge so it was the perfect opportunity to use them. 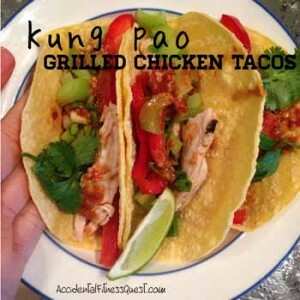 By making the kung pao part into a sauce instead of a marinade, I was able to cut down on the prep time and have these tacos ready in just about 7 minutes. Most kung pao dishes are sprinkled with peanuts to add flavor and texture. I was able to use PB2 in place of the peanuts or peanut butter, and the celery added a nice crunch to take the place of the peanut texture. The best of both worlds – peanut flavor and crunch – but without the calories and fat. In a small bowl, mix the soy sauce, sambal oelek, PB2 and garlic until combined. Slice the chicken breast into bite sized pieces and microwave for a minute or two until warm. Warm the tortillas. Divide the chicken breast evenly into the 3 tortillas and add the green onions, celery and red pepper. Drizzle on the Kung Pao sauce mixture and garnish with the cilantro and lime slice. Makes 3 tacos at approximately 326 calories – 33g protein, 35g carbs, and 6g fat. You can easily make it to your liking by changing the amounts of veggies and chicken so that it’s perfect for you. I like mine heavy on both, but some people like more chicken and less veggies or vice versa. I even had some veggies and sauce leftover and tossed them in a bowl for a side salad. If you’re still looking for ways to use up your bottle of sambal oelek, try the Thai Curry Turkey Fritters or Szechuan Stir Fry. You can even just spread it on your eggs or burger instead of sriracha. I love that stuff!